I'm not sure how many more we can take in this class. Alabama signed 24 players during college football's early signing period, and it appears the Tide will sign approximately five or six more players Wednesday. The Tide has four committed players -- Robinson at running back, Williams at defensive back, defensive lineman Byron Young and defensive end Khris Bogle, who committed to Alabama on Jan. 5. It appears Alabama will prefer to take two more defensive lineman -- a position of need this season. 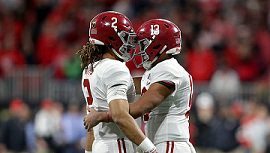 If Sospher picks Alabama and Young sticks with the Tide, that would satisfy that need. But if either or both go elsewhere, other possibilities include flipping Florida State Quashon Fuller, a 6-foot-2 1/2, 270-pounder from Lehigh Acres (Fla.) and Jacqueze Sorrells, a 6-foot-3, 310-pounder from Winter Park High in Orlando, Florida. Alabama was also involved with Seminary (Miss.) defensive lineman Nathan Pickering, but it appears he will stick with his Mississippi State commitment. Alabama also wants another linebacker, and To'oto'o sits atop the wish list. Other possibilities for late additions include 3-star tight end Brett Seither, a 6-foot-5 tight end from Clearwater, Florida; 4-star offensive lineman Javonne Sheperd, a Texas commit from Houston; and Ealy at running back. That makes it sound like we can handle the numbers. I bet CNS has a plan already laid out for each. he is a perfectionist and he won't get out coached next year I bet. RTR! Looks like we're going to get DE Quashon Fuller from FSU. And looks like we're losing Sopsher to LSU. Not a done deal, but that's how it looks tonight. Never thought we'd get him, between him wanting the package deal, and then his stock falling. Fuller will be a nice get if we bring him in. The only thing that concerns me is his comment, "This is a place to me." WTH does that mean? Carson Beck, 10th ranked pro-style QB for the 2020 class, decommitted from Bama on Saturday. I heard part of an interview with him about his call to Coach Saban. It doesn't sound like he crossed us off his list, just that he wanted to be upfront about where his head is at, and he said it was a good conversation. He sounded like a smart kid. Excellent assessment. E-cred for posting, thanks. Page created in 0.309 seconds with 31 queries.